IMMERSIVE PARANORMAL VIRTUAL REALITY EXPERIENCE COMING TO HALLOWEEN HORROR NIGHTS! Today on the Universal Orlando Blog, a new VR experience was announced for this year’s HHN 26 event! ORLANDO, Fla. (August 12, 2016) – Universal Orlando Resort is unveiling a cutting-edge – and terrifying – interactive experience that will blend custom virtual reality technology with real-life characters and environments to create a whole new generation of psychological horror. The twisted minds behind Universal Orlando’s award-winning Halloween Horror Nights have combined forces with Universal Creative, the creators of award-winning theme park attractions, to produce a next-level, immersive theater experience that seamlessly bridges live action and virtual reality (VR). “The Repository” is an exclusive, limited-time attraction with an entirely unique storyline that will pave the way for even more brand new, best-in-class experiences across Universal Orlando Resort. Throughout this extended, heart-pounding adventure, guests will explore highly thematic physical environments and interact with real-life characters – all while working in small teams to solve a dark mystery unfolding before them. Universal Orlando is working with VRstudios (VRcade), a Bellevue, Washington company specializing in unique VR experiences. The company designed a first-of-its-kind VR platform to be used inside the experience. “The Repository” will be available to guests during select Halloween Horror Nights events, beginning Sept. 29 and running through Oct. 31. Guests can upgrade their Halloween Horror Nights event ticket to become a part of the ultimate paranormal experience. This limited-time experience can be purchased for $49.99 plus tax and will be available for purchase by calling 407-224-7840. Halloween Horror Nights admission is also required. Universal Orlando Annual Passholders can purchase tickets beginning August 16. Tickets will be available to the general public beginning August 23. VRstudios (www.vrstudios.com) is the industry’s emerging premier global VR company offering unique VR content, experiences and solutions to the entertainment and commercial enterprise industries, through its unprecedented patent-pending platform and turn-key systems. VRstudios is the FIRST and ONLY VR company offering a wireless-streamed system and a collection of capabilities that includes full motion, simultaneous multiple users in the same physical and virtual space, enhanced spectator capabilities and 1:1 tracking – all to provide a fully immersive and interactive VR experience. VRcade is the gaming and entertainment brand of VRstudios. Launched in 2014, VRstudios is based in Bellevue, Washington. Follow VRstudios on our Facebook, Twitter, and LinkedIn. While sadly, it’s unlikely we’ll be in Orlando to attend the event, we know some people who surely will, and will let you know what they think of the experience! Universal Orlando Resort is unveiling a cutting-edge – and terrifying – interactive experience that will blend custom virtual reality technology with real-life characters and environments to create a whole new generation of psychological horror.The twisted minds behind Universal Orlando’s award-winning Halloween Horror Nights have combined forces with Universal Creative, the creators of award-winning theme park attractions, to produce a next-level, immersive theater experience that seamlessly bridges live action and virtual reality (VR).“The Repository” is an exclusive, limited-time attraction with an entirely unique storyline that will pave the way for even more brand new, best-in-class experiences across Universal Orlando Resort. Throughout this extended, heart-pounding adventure, guests will explore highly thematic physical environments and interact with real-life characters – all while working in small teams to solve a dark mystery unfolding before them. 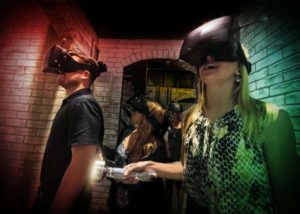 Universal Orlando is working with VRstudios (VRcade), a Bellevue, Washington company specializing in unique VR experiences. The company designed a first-of-its-kind VR platform to be used inside the experience. Will it be worth $50? That’s a pretty hefty price tag, but I have seen similar upcharge experiences at other haunts (such as Busch Gardens Tampa’s Alone experience), so, for me, it’s dependent on length and, honestly, if you get some kind of swag at the end. A t-shirt or something (nothing is mentioned in the announcement). After all, we experienced no upcharge to use VR in Six Flags’ Ride of Steel roller coaster. How do we feel about HHN adding an upcharge VR event? Check out our initial impressions in the video below. Rogue One: A Star Wars Story New Trailer!